The importance of having cold or otherwise temperature-controlled drinks on hand whenever you want them can't possibly be overstated. After all, there are so many different occasions and instances where this can make – or break – a given situation. Whether you want to have ice cold beer at the ready for your next party or the big game, or you are a wine aficionado who values the taste and quality of your favorite Chardonnay and Cabernet Sauvignon above all, you undoubtedly know that you can't always rely on any old refrigerator or cooler to provide the perfect climate that you need. Fortunately, you can easily find specific appliances that can match up to the task of keeping your favorite drinks ready for optimal enjoyment, no matter when you need them. You'll want to take a look at a few that are perfectly equipped to fit this bill. Anyone who considers himself or herself a dedicated wine lover – an oenophile, if you will – is well aware of how necessary it is that wine be tasted at the perfect temperature. If it isn't, there's a chance that a fair amount of the flavor will be lost, thereby essentially defeating the purpose of the experience. While truly good wine will, more likely than not, be drinkable at the very least no matter what, it probably won't live up to its full potential if it's served too warm or too cold. This is true no matter what you're drinking, whether it's a red, white or rose wine. Here's where wine coolers come in. These appliances are specifically designed to accommodate the finicky temperature needs of any bottle – and any wine lover. Regardless of what your specific preferences are, the right wine cooler can be adjusted to meet them. For example, certain models have separate sections for red, white and sparkling varieties, with different temperatures for each. A typical baseline measurement would be about 60 degrees Fahrenheit for reds, between 50 and 55 degrees for whites and 45 (give or take) for Champagnes, Proseccos and other sparkling wines. You may also want to find a cooler that features a tinted door, which keeps excess light away from particularly sensitive wines. This might sound like a small concern, but it's worth considering. Wine coolers are available in a wide variety of sizes, and you'll want to consider what will be most appropriate for your needs. If you know that you are going to be storing dozens of bottles at a time, you'll want to go with a larger model. A cooler that has storage for at least 24 bottles is a wise choice in that case, and you can find models that store 50, 100 or more bottles as well. Also, because many wine bottles are different sizes, it might be safest to buy a cooler that has space for more than you might actually need – in order to accommodate larger or uncommonly shaped bottles. While an ordinary refrigerator can keep cans or bottles of beer cold, it doesn't provide for the freshness that you can get from a glass of draft beer in your favorite bar. As a result, you can't get quite the same taste even if you keep the beverages as cold as you want. Luckily, kegerators offer a perfect way around this dilemma. These appliances house kegs of beer so that not only will your favorite lagers and ales be ice cold, but they will also have the freshly tapped taste that any beer lover well tell you simply can't be beat. If you entertain a large number of guests on any regular basis, having one of these on hand will be an invaluable asset. Various kegerator models are made for both exterior or interior use, although some are only appropriate for one or the other. The choice here is entirely yours – it depends on whether you're more likely to use it for indoor or outdoor events. 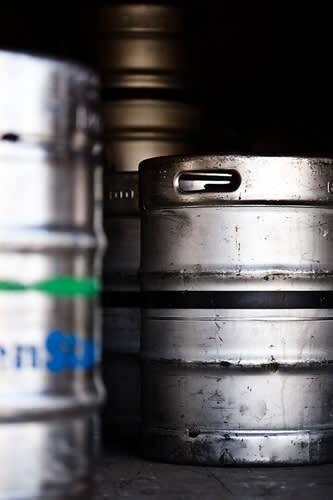 Most of them have a maximum keg size that they can accommodate – quarter, half or full – so take note of this. Also, be sure that the appliance's compressor allows for a solid range of temperature adjustment. While you don't want to go warmer than about 50 degrees Fahrenheit, it's good to have the ability to alter it based on the beer you've tapped.